2018 was another busy and exciting year for erz. This year the erz team has expanded to meet our ever-growing portfolio. New members of staff include Senior Landscape Architect Kevin Jones, graduate Landscape Architects Catherine Browne and Emily Cropton and Architectural Intern Freya Bruce. We have also had the delight of working with Landscape Architecture Intern Winki Ho and Urban Design Intern Rory Kyle who have now returned to university. We would also like to say a big thanks to Tom Witham and Chris Swan who departed from erz this year to pursue new careers in teaching and landscape photography respectively. We wish them both the best of luck for the future. After four highly valued years, David Hammett has been promoted to Landscape Architect in February and following that passed his professional exam in May to become a chartered Landscape Architect. Hearty congratulations to David who topped it off with getting married this summer. 2018 was a year in which we saw two flag-ship projects for erz completed. We were delighted to see the opening of the Prince and Princess of Wales Hospice in October. After six years of hard work, it is fantastic to see the facility open, and we look forward to seeing how the therapeutic design helps patients, families and staff in the years to come. In July, Dunoon Waterfront was also completed. The public realm works have transformed a grim, traffic dominated site into a distinctive and welcoming portal to Dunoon, Argyll and the Loch Lomond National Park. New projects in the office include delivery works for Foresterhill Campus in Aberdeen following the successful SNH green infrastructure grant funding led by erz; Lochgilphead waterfront and public realm works; Port Dundas housing scheme in Glasgow and over twenty new nursery and primary schools for a range of clients across Scotland. As usual we are working for a very diverse range of clients. This year we have worked on 42 projects, of which 5 have been delivered and 3 are currently under construction. Projects vary from schools, nurseries, housing, health, art trails and public realm to landscape assessment and architectural and landscape heritage design. We have won four awards this year:we were delighted to win a Highly Commended Landscape Institute award for Royal Edinburgh Hospital, the judges noting “This scheme could be a game-changer in terms of how acute mental health care is delivered”. 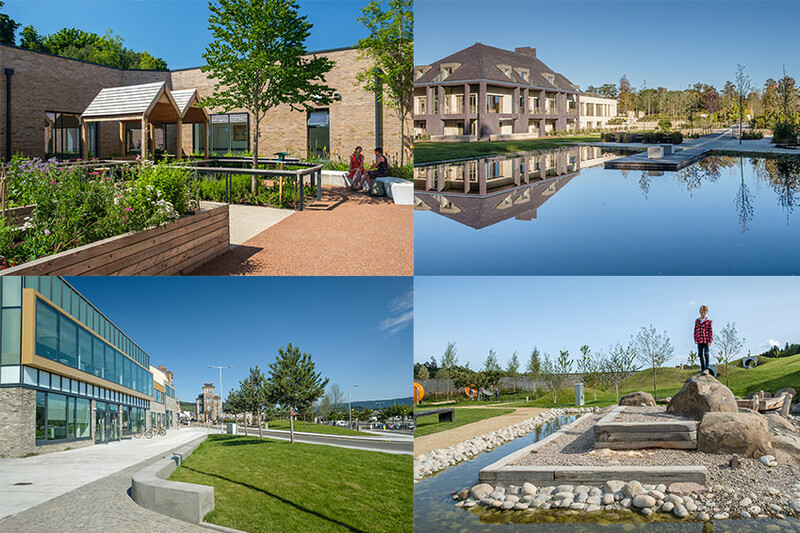 Other award-winning projects are Brodie Castle Playful Garden, and Orchard View Health Centre. Our new graduate, Emily Cropton, received two awards for her student portfolio including the highly prestigious ‘International Landscape School’s Prize’ from the Landscape Biennial. We would like to thank all our clients, collaborators and friends for making 2018 such a brilliant year. From all of us at erz, we wish you all the best for 2019. From Rolf, Felicity, Murray, Kevin, David, Emily, Catherine, Freya and Jackie.